A long time ago there was a group of people who believed in the same things. They formed what we know as the church. The early years of the church were strong and full of love for the Lord and each other. They, the church, met all through the week to read Scripture, the Bible, and to have fellowship together. They loved each other so much that they shared their stuff with each other. When someone had a need, it was met by another person in the church. If someone needed food, they shared it. If someone needed to borrow a donkey, they would let him. When someone was in need of clothing, they gave it. The Bible says they shared everything. Some people sold some of their things and brought the money to the church to be divided among the people in need or to pay for expenses in the church. You can read about them sharing in Acts 4:32-35. Our story today is about a married couple named Ananias and Sapphira. They wanted to share their stuff too. They had a nice piece of property that they thought would bring in a lot of money they could share. The couple put the property up for sale, and it sold for a large amount. 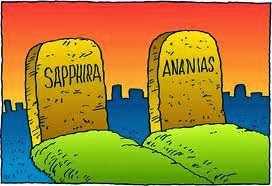 Ananias and Sapphira owned the property, and when it was sold, they owned the money from that sale. They could have kept the money. It was theirs. Instead, they wanted to give some of the money and keep the rest. That would have been fine to do. It was their money. The problem was, they wanted everyone to think they gave all the money to the church. So, together they made a plan. 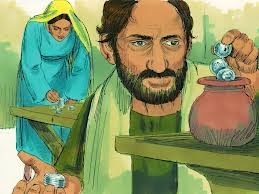 They kept some of the money but told the people in the church and the apostle Peter that they were giving all of the money. It was a lie. Remember, they could have kept the land. They didn’t need to sell it. They could have kept all the money. They didn’t need to give it. They could have kept part of the money. They didn’t need to give it all. The problem was they lied. Who did they lie to? They Lied to God. 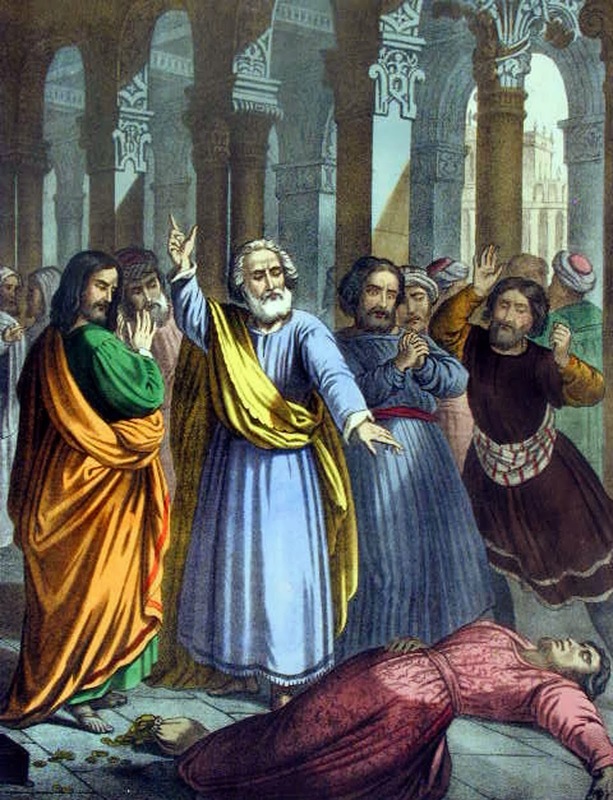 The Bible says that while Ananias was telling Peter that they gave all the money, he fell down dead. God took his life for lying to Him. Then the men took his body out and buried him. Later that day, Sapphira came in and told the same lie. She immediately fell down dead. They took her body out and buried her next to her husband. The Lord God hates lying lips. He wants us to always tell the truth. He loves it when we tell the truth. Every untruth is a lie. It could be small or large, it doesn’t matter. A lie is a lie. What do you think the people around them thought? They were afraid. We all should be afraid of telling lies. A lie will hurt you in the end. It never pays to lie. You can read this true story in the Bible, Acts 5:1-11. Proverbs 12:22 Lying lips are an abomination to the Lord, but those who deal truthfully are His delight. Colossians 3:9 Do not lie to one another, since you have put off the old man with his deeds. The "old man" in this verse is talking about our old, sinful nature. Proverbs 6:16-19 These six things the Lord hates, Yes, seven are an abomination to Him: A proud look, a lying tongue, hands that shed innocent blood, a heart that devises wicked plans, feet that are swift in running to evil, a false witness who speaks lies, and one who sows discord among brethren. 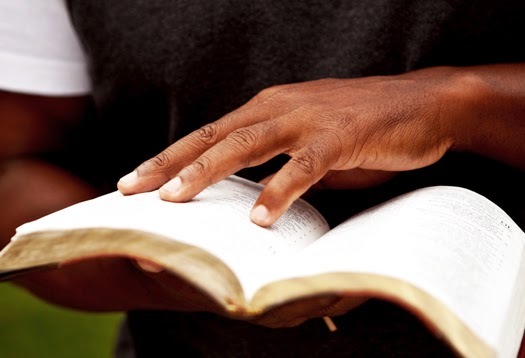 Memorize: Colossians 3:9 Do not lie to one another, since you have put off the old man with his deeds.